February 26, 2019 Robert W.
Fast next day dust control signs in Clark County Nevada are sometimes needed for that construction project. Fast next day dust control signs can be made quickly, especially when the Air Quality Management Board is threatening to shut down your construction site over a misunderstanding of a sign. In actuality, this happen more frequently then you think. The Air Quality Management Board can shut down your construction project or levy fines. There are basically two types of dust control signs, the 4ft x 4ft sign and the 4ft x 8ft dust control sign. Both signs are required to have certain text and text size on them along with pertinent information regarding the construction project. The 4ft x 4ft dust control sign is for construction projects that are under 10 acres in size and the larger, 4ft x 8ft dust control sign is required for projects 10 acres and over. Fast next day dust signs are not expensive. The cost of a 4ft x 4ft aluminum dust sign is under one hundred dollars and the cost of a 4ft x 8ft dust control sign is around $175.00 for aluminum. Many contractors prefer aluminum to the old heavy wood dust permit signs because they are easy to put up, cost less and if damaged, can be straightened out. many times at a construction site a bulldozer or trench digger will accidently hit the dust sign and run over it. If the sign is made out of aluminum, it can be straightened out and replaced, but if the sign is made out of wood, the wood will crack into pieces. Fast next day dust signs can be made the same day, but usually its next day. Contact your local sign store to order your dust control sign and best of luck with your new construction project. November 8, 2018 Robert W.
Las Vegas construction dust signs are mandated by Clark County Air Quality Management Board when moving earth to construct a building or structure. Clark County Nevada takes pollution mighty serious and regulates the dust that can be put into the air when doing construction. Failure to comply with the Clark County Air Quality Management Boards rules and regulations and cause fines and your construction project to be shut down. More information can be learned form the Clark County Air Quality website. Construction dust signs usually come in two different sizes. For less than ten acres, a 4ft x 4ft dust sign is required and for properties over 10 acres, a 4ft x 8ft dust sign is required by the Air Quality Management Board. On these signs, the text has to be a certain size along with certain wording on the sign as well. For example, the name of the project, expiration date of the project, contact information, etc. need to be on the sign. The signs nowadays are generally made out of aluminum versus the older style MDO board ( wood). Construction companies like the lighter weight signs because it only takes one person to install a aluminum sign and in cases of where the sign gets hit or run over by large construction equipment, the aluminum sign can be straightened out versus having to replace a broken wood sign. The cost of a 4ft x 4ft sign is $99.00 and the larger 4ft x 8ft sign is $175.00. The sign is printed on a vinyl substrate and then laminated for protection against the weather elements. The aluminum is weather proof and can withstand rain and the intense heat of summer. if dust renewals are needed, you can simply put a vinyl patch over the dust sign to give your dust sign more life. December 4, 2017 Robert W.
Fast Clark County Air Quality dust signs are sometimes needed for the construction projects that require a dust permit sign. The Clark County Air Quality Management Board http://www.clarkcountynv.gov/airquality/Pages/FeeSchedule.aspx require a dust permit sign for construction projects where dirt is moved and where the possibility of this dirt getting into the air in Clark County. There are many rules and requirements set forth by the Clark County govt. regarding this issue. These rules and requirements must be met or you could potentially face fines and stop orders along with more punitive measures against you and your construction company. Fast Clark County Air Quality dust signs are usually made out of aluminum or wood. Many contractors prefer the aluminum dust permit signs over the wood dust signs because the aluminum sign does not weather. Also, at construction sites, the likelihood of the dust permit sign getting run over or damaged is often the case and with an aluminum sign, it will merely bend and not break like a wood dust sign. These aluminum signs are usually attached to wooden posts that are placed into the ground and simply screwed into the posts. Also, these dust signs can be attached to an existing fence and simply wired to the fence. Fast Clark County Air Quality dust signs are not expensive. The mandated 4ft x 4ft dust signs made for construction projects 10 acres or less costs around $99.00 and the larger 4ft x 8ft dust control sign that is for projects involving more than 10 acres of land are well under $200.00. These signs can be made rather quickly and often the same day if necessary. Sign companies like www.Posterhead.com and other can make the signs for you fast. 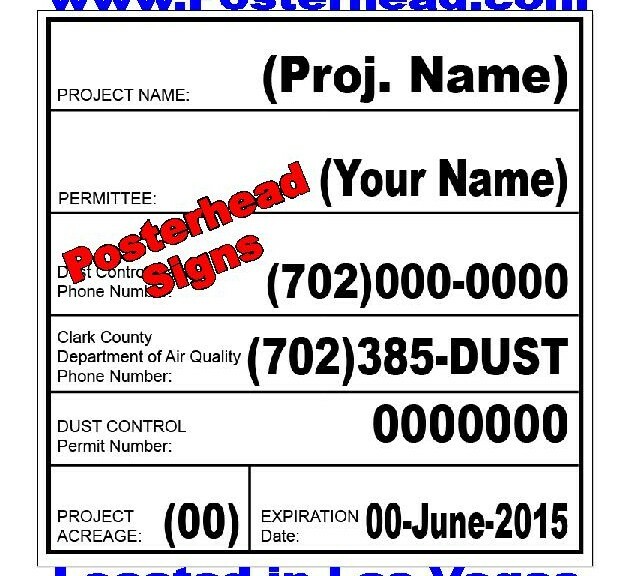 Contact a local sign company today in Clark County and get that dust control permit sign made for your project. July 6, 2016 Robert W.
Henderson Nevada air quality dust control signs are cost prohibitive. The cost of a 4ft x 4ft dust control sign is under $100 and if your construction project is over 10 acres, a 4ft x 8ft dust control sign is required. The larger dust control signs sell for under $180.00 and can be modified if the dust construction project lasts more than a year ( The Clark County Air Quality Management Board issues dust permit for a period of 1 year with renewals if necessary) These dust control air quality signs are made with aluminum which allows for the sign to last a long time in the Las Vegas Valley. Many times the signs will be made with inferior materials like coroplast or vinyl and have to be made over after sign failure because of the cheap quality of the signs. A aluminum sign blank can withstand the weather elements and is lightweight, which is important in that 1 person can install the sign instead of 2 people, thus cutting down on your sign installation. April 17, 2016 Robert W.
Heavy duty dust control signs are now available in Las Vegas for construction projects that are required to have a sign by the Air Quality Management Board. There website for additional information is http://www.clarkcountynv.gov/airquality/Pages/default.aspx. Heavy duty dust control signs in Las Vegas are made with a double sided aluminum panel that has a filler substrate between the outer aluminum panels. This e-panel or die bond panel as it is known, makes a strong substrate of choice for a dust control sign in Clark County. Many years ago, the signs were made with mdo board, a thick wood to withstand the weather conditions of Las Vegas. These old mdo dust control signs were heavy and would deteriorate in the Las Vegas weather elements. With the newer heavy duty aluminum dust control signs ( which are far lighter and stronger) the signs can last for years, which is important if you have a large project with several modifications. With the printing of the sign in eco solvent or latex inks, the sign will last for years and not fade in the intense heat and sun of the Las Vegas summer months. There are fines and other penalties in Clark County for not having the required dust control signs and it is up to each contractor to make sure they are in compliance with all necessary laws regarding air quality. In addition to fines, the construction project can be shut down and valuable time can be lost. Heavy duty dust control signs are not as expensive as you might think. A 4ft x 4ft dust control sign sells for about $99 and the larger 4ft x 8ft dust control sign sells for about $175.00. These dust control signs can be purchased at local sign shops in the Clark County area and be made in a short time. March 22, 2016 Robert W.
Dust control signs are mandated to be 4ft x 4ft for a construction project under 10 acres and a 4ft x 8ft dust control sign is required for a construction project 10 acres or more. Certain size lettering is required along with a specific design that allows for residents to notice the sign and make contact with the construction designee or government official if their is too much dust in the air. las Vegas is a desert that contains a great amount of dust on the surface and consequently, if disturbed, a great amount of dust is liable to go into the air if moved around. Strict adherence to the rules of dust control are a must or fines and possible shut down of the construction project may occur. Las Vegas air quality management dust control signs are not that expensive. The cost of a 4ft x 4ft dust control sign is about $99 and the cost of a 4ft x 8ft dust control sign is around $175.00. These signs are made with printed vinyl on an aluminum substrate instead of the old wood signs that often weather quickly and deteriorate. An aluminum sign is rust proof and will last a very long time in the weather conditions of the Las Vegas area. Not only is it lightweight as compared to the wood signs, they are easy to handle and install at the construction site. Las Vegas air quality management dust control signs can be purchased at Las Vegas sign shops at very reasonable prices and in a short period of time. March 9, 2016 Robert W.
Construction dust control signs in Nevada are mandated in certain areas because most of Nevada is in the desert and accordingly, has a lot of dust and loose topsoil. When the Nevada desert top soil gets moved around, it causes a lot of dust that then goes into the air and make it uncomfortable for many people. Consequently, many local government puts restrictions on construction companies regarding dust in order to control the airborne dust particles. Clark county Nevada is one local government agency that controls and regulates dust at construction sites. Clark County Nevada dust control information can be found at www.clarkcountynv.gov . Clark county requires a 4ft x 8ft dust control sign on the premises for construction sites 10 acres and more, while a 4ft x 4ft dust control sign is needed for under 10 acres. These dust control signs need to be prominently displayed at the construction site that has a permit so that the public can read them and know who to complain to if too much dust is in the air. Construction dust control signs in Nevada are nor expensive. While in the old days, wood was used for the dust control sign, lightweight, strong aluminum has replaced the old wooden signs. These aluminum signs are designed not to rust or get wood rot and can withstand all the elements that Mother Nature in Nevada has to offer. The cost of the 4ft x 4ft aluminum dust control sign is under $100 and the cost of the 4ft x 8ft dust control sign is around $175.00. Many times the dust control signs will be laminated for long lasting and for appearance. Construction dust control signs in Nevada can be found at numerous sign shops in Nevada and are mandated in certain areas. Failure to comply can result in your construction project being shut down and fines. February 21, 2016 Robert W.
North Las Vegas air quality dust control signs are mandated by Clark County Air Quality Management for construction projects. Since Las Vegas is the desert and built on dust, it only seems reasonable that we do not want a lot of dust in the air that we breathe. North Las Vegas air quality dust control signs information can be found at the Clark County, Nevada web address, http://www.clarkcountynv.gov/airquality/compliance/Pages/Compliance_DustPermits.aspx.Generally speaking, for a construction project that is less than 10 acres, a 4ft x 4ft ]dust control sign is needed and for more than 10 acres, a 4ft x 8ft dust control sign is required. Failure to have the proper dust control sign in place can result in fines and revocation of the building permits. The sign needs to be a certain size with the minimum height of text and certain language on the sign and posted in a conspicuous place on the construction site location. Specifics can be found at the above web address of Clark County. North Las Vegas air quality dust control signs are made with wood or aluminum. I prefer the aluminum because it will not rust or get wood rot over a period of time. A e-panel aluminum sign is lightweight and long lasting as it has a filler substrate mounted between 2 outer aluminum panels that also gives it a nice finish. Dust control signs are not expensive with the 4ft x 4ft dust control sign going for less than $100 and the bigger 4ft x 8ft aluminum sign going for about $175.00. These signs are easily mounted to 4″ x 4″ wood posts and can be moved rather easily since they are lightweight. Even though they are lightweight, believe me when I say they are tough and long lasting. Contact a local sign shop in the Clark County area and see how these dust control signs look. February 17, 2016 Robert W.
Cheap dust control signs allow for construction projects without killing the bank. In Clark County Nevada, dust control signs are mandatory for construction projects because living in the desert means there is a lot of dust. Clark County Air Quality Management agency regulates the air that we breathe in Clark County. Because of the amount of dust that naturally occurs in the desert, and the amount of dust that a construction project kicks up, the Clark County Air Quality Management forces construction companies to post a dust control sign and place it in a conspicuous spot. For further information about Clark County Air Quality Management, see http://www.clarkcountynv.gov/airquality/compliance/Pages/Compliance_DustPermitting.aspx for more information regarding dust control signs and regulations. Cheap dust control signs are usually 4ft x 4ft and any construction project 10 acres or more requires a 4ft x 8ft dust control sign. There are certain height requirements of the letters and other specific information on the dust control signs that are required by law. A violation of these rules and regulations can stop a construction project and force a fine if you are found in violation. Cheap dust control signs are very inexpensive. A 4ft x 4ft dust control sign would cost less than $100 in Clark County and less than $200 for a 4ft x 8ft sign. These signs are mounted on wood or the newer style is a aluminum panel that resists rusting or wood rot. The text is printed with outdoor inks that will not fade in the harsh sunlight of Southern Nevada. The newer style of dust control signs is lightweight and easy to transport and install. Simply dig some secure posts in the ground and go right through the aluminum panel with a screw and washer in different areas to secure the sign to the posts. Cheap dust control signs can be found at local sign shops in Clark County. February 13, 2016 Robert W.
Discount Clark County dust control signs are being purchased by smart construction companies all over the Clark County area. Why pay several hundred dollars for a dust control sign when you can get a discounted price. Dust control signs are mandated by Clark County,http://www.clarkcountynv.gov/airquality/compliance/Pages/Compliance_DustPermitting.aspx, Clark County’s requirements can be found at the link above. Discount Clark County dust control signs are made with an aluminum substrate and then applied with a vinyl application to make sure that they last a long time. A large 10 plus acre construction job will last a long time and a long lasting sign is needed. That is why state of the art inks are used in printing of the sign so make sure that they do not fade in the extreme weather conditions that Las Vegas has to offer. These inks will last years in the outdoor weather of Las Vegas and are mounted on aluminum, versus wood or steel. Steel will rust in the outdoor weather and wood often gets damaged in the Las Vegas weather and does not hold up well. Aluminum will not rust. A filler panel put between 2 sheets of aluminum gives the sign rigidity. Discount Clark County dust control signs are not expensive and can be designed and printed at cheap and discount prices. A complete 4ft x 4ft dust control sign mounted on aluminum with your custom information to your construction project is less than $100.00.